We bought a “portable” washer! And by we, I mean me, my roommate, and my two classmates who’ll be moving in next door. We got it off craigslist from a couple who work for our university but are going on sabbatical. It was listed for $150, but unasked, the lowered the price to $130. They had nothing but good things to say about the washer, and I finally tried it out today! I thought it was going to be a sunny day and it has been, on and off, which makes it a good day for laundry since we didn’t buy a dryer so I’ll be air drying my clothes (so long as the weather’s good enough for it, I guess. Not sure about the winter). The washer is currently being stored in my bedroom (our living room is overfull at the moment and I have the bigger bedroom. Unless we can think of a better place for it, I’m happy to leave it here), and being run in the kitchen. It has wheels, although they’re only on the front, which baffles me a little. It hooks up to the sink faucet, and has a separate pipe for draining used water. It’s really easy to use, holds about 1.7 cubic feet of clothes, and spins them down really well. No dripping at all onto my bed. To use the machines our building provides, it costs us $1.50 per washer load and $1.25 per dryer load. I do at least a load of laundry a week, more once I factor in occasionally washing sheets and the table cloth and the bathroom mats, so at least $78/year in washing and $65 a year in drying. The washer cost me $32.50, and it remains to be seen how much it’ll drive up our water bill, but I doubt it would be even $5 a month (which would be $60/year, still cheaper, and that would be split between my roommate and I). I’ve been hang drying the majority of my clothes since the weather got warmer, so already I’ve been saving money there. 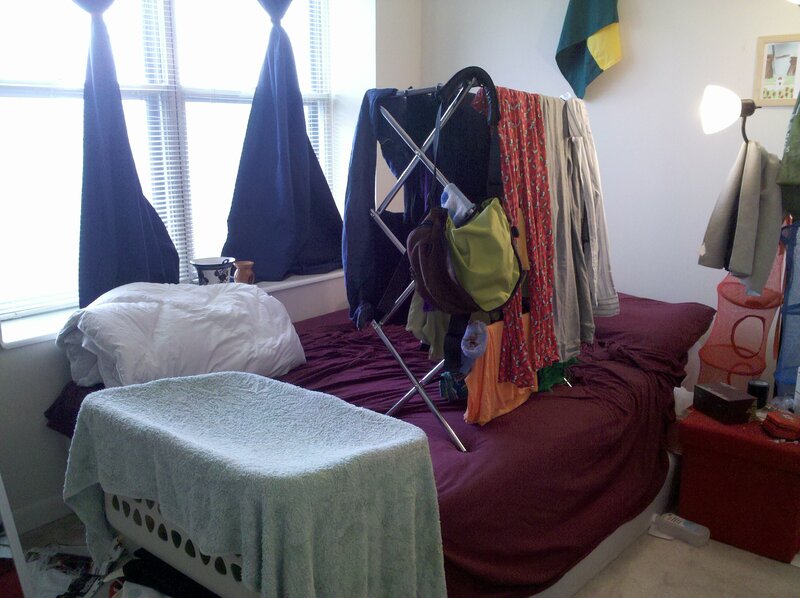 I expect I’ll use the building dryers every now and then (like for pillows or anything down filled), but I think I can rely on air drying the majority of the time. Some people prefer air drying, cost saving value aside. I’m ambivalent about the difference between air dried and dryer dried clothes (though I’ve finally decided to be responsible and stop ruining my undergarments by putting them through the dryer, because shopping for them is such a pain), but I really like to save money, and that’s enough reason for me. I grew up with both air dried and dryer dried clothes so both seem normal to me. I think my boyfriend prefers air dried, and the girl I bought my drying rack from does too. I definitely think buying your own washer in an apartment can be a good idea, but I don’t think a dryer is really necessary unless you have really bad circulation or maybe if there isn’t one available at all in your building. I can’t recommend a washer as a rule, because it depends on a number of factors. You need to do the math yourself and figure out if it works out in your favor. Buying ours used and splitting it among four people were key factors. My roommate and I have also bought a chest freezer (fourth year buy! it’s 5 cubic feet) but more on that later. =) It’s still quite empty because we just got it on Monday. It sounds like a great purchase. Air drying your clothes on a clothes drying rack is really very environmentally friendly. I have read that in the US that something like 10% of domestic power use goes JUST to dry clothes. Maybe if we don’t need that 10% we can actually reduce our energy needs and we won’t want to drill out in the deep ocean and up in ANWAR in the future.